The story of North Glasgow during the First World War shows how our city had to change and make do when faced with so many working aged men away fighting. This is the first of three trails which will be uploaded to this website in the coming months. 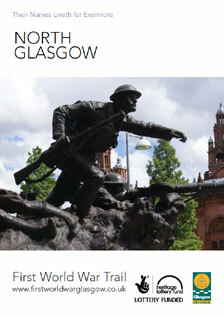 The First World War Trail tells the stories of how Glaswegians had to adapt when we were at war. In the North Glasgow First World War Heritage Trail you can visit the Springburn Fire Station where women from local factories where trained to be fire fighters after near 68% of the Glasgow Fire Brigade enlisted. Or Possil Tramways which was one of the city's three famous Pals Battalions raised by the Glasgow Corporation Tramways. Or read about the Anderson Family in Woodside Terrace, which lost all four of their sons during the war. Or visit the Botanic Gardens, which was used in 1916 as a meeting location by some of Glasgow's Anti-war Movement.